If you’re using a BeagleBone Black and want to flash your onboard eMMC memory, you need to do one more thing. If you’re going to boot Linux directly from a microSD card or you are using an Original BeagleBone, you don’t need to complete this step. BeagleBone Black Rev A and Rev B have 2GB. 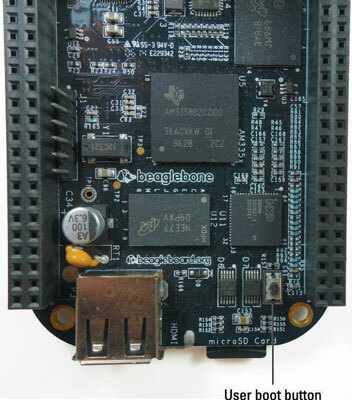 BeagleBone Black Rev C comes with 4GB. Using built-in storage means something slightly different from running your OS on your microSD card. You don’t need to worry about the fact that BeagleBone Black Rev A and Rev B have only 2GB of onboard eMMC memory. 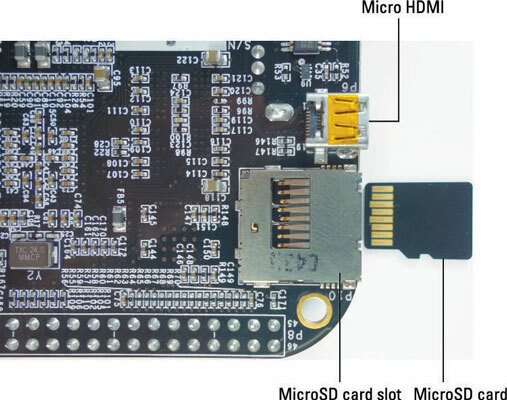 While your BeagleBone Black is powered off, insert your microSD card into the microSD slot. Hold down the user boot button of the BeagleBone. While holding the user boot button, press the power button on your board. When the board is powered up, you should continue to hold the user boot button for 5 to 7 seconds and then release it. The USR LEDs blink during this process. Flashing can take about 30 to 40 minutes. When this process is finished, all four USR LEDs will be off. If you don’t remove the microSD card the next time you boot your BeagleBone Black, or if you remove the microSD card while the flashing process is occurring, your eMMC memory can get corrupted and your BeagleBone Black won’t boot. If the card does become corrupt, you have to repeat this process to flash your BeagleBone’s eMMC memory properly.